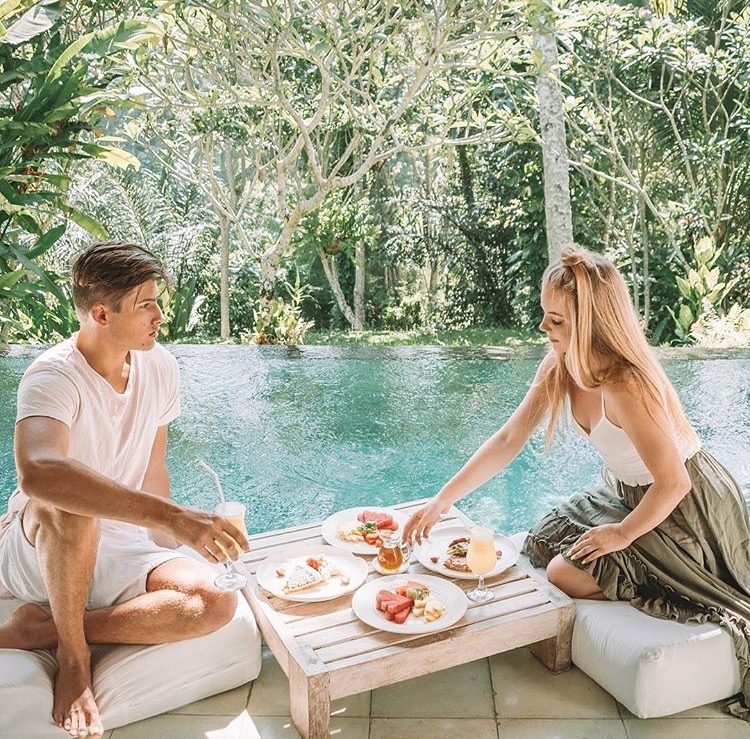 Australian food, travel & fashion blogger Brooke from @brookestyless takes you to Bali – one of her favourite destinations! 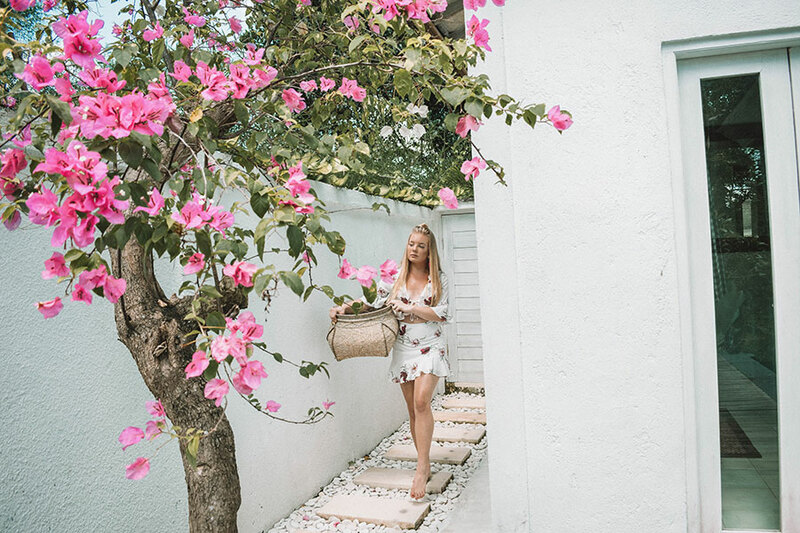 Follower her to the most stunning private luxury villas and charming hotels in Nusa Dua, Ubud, Canggu & Seminyak and keep on reading for Bali’s best photo opps and why she keeps on coming back! Day 1: We arrived at the Sakala Resort and was welcomed by a breathtaking view of Nusa Dua beach through the beach club from lobby. The lobby itself was welcoming to sit and we waited a few minutes before our room was already ready for us. We quickly checked in as we were so eager to explore our new home for the next two days. Our room looked over the main pool within the hotel that laid Bali huts along its edge. Between was a pool bar and I knew that is where I was going to spend most of my time. We headed down there and enjoyed a good Pina Colada before making our way down to the beach club. The beach club was breathtaking. It had a long stretched infinity pool that overlooked the beach. This just made it difficult as now I was so torn where to hangout and tan for the next two days as my heart fell for both the the hotel pool and the beach club. As the sun started to set our bellies rumbled for food so we took a short stroll down the street where the Sakala was located to find eateries galore. We settled for a $3 nasi goreng then headed our way back to bed. Day 2: Today I woke up really early – 6:30am Australian time is 4:30 Bali time and the sun hadn’t popped up to show yet. I knew this would mean I was up for sunrise and I could get some amazing photos at the beach club. I blew up my brand new shell Floaty and dragged my boyfriend down and we got some killer shots! By the time we were finished we were ready for breaky and gosh does the Sakala put on a feast! We ate to our hearts desire then made our way back to our room before heading off down town. We grabbed a quick feed at a small Mediterranean shop and headed back to the Sakala for a couples massage. This could be the best massage I had had. The ladies at the Sakala greeted us with a cool cucumber drink and face cloth. We then enjoyed an hour of total bliss and finished it off with a warm ginger tea. My kind of heaven! The rest of the afternoon was spent hanging around the beach club pool with a nice afternoon tea then off for a early night sleep. Day 3: After a nice night sleep, we headed straight to breakfast and stuffed our faces for the second day. This was our day to say goodbye to the beautiful Sakala and head off to Ubud. On the way to Ubud, we stopped at some must see attractions that we didn’t get to check off on our last trip. We first stopped at the Bali Swing and if you have time for this attraction it is definitely a must do! The 4 swing look over the rice terrace and jungle of Ubud and it really a great insta worthy opportunity. You’re also welcomed to a cold soft drink and lunch which is covered in your entry. Our next stop was the Tegallalang rice fields and it was only a short drive from the bali swing. It was flooded with tourists but still well worth the visit. A small donation and you can walk freely around the rice fields and take as many snaps as you like. We then headed off to our next villa, The Shamballa Moon. By the time we checked in the sun was setting and the pink sky glistened against the blue pool and made the whole villa glow. We were serve dinner by the pool and enjoyed the company of each other in this peaceful slice of Ubud. Day 5: Today we are leaving the beautiful Shamballa Moon and heading into Canggu. Canggu is our favorite place in all of Bali to holiday and when you see it you will see why! This morning before we checked out enjoyed the best home made pancakes and last minute sun beside the pool. We said our last thank yous to the beautiful team and headed our way to Canggu. Before we hit the coastal town we made a quick stop into the Ubud Monkey forest to take some cool pictures and feed the monkeys. It costs about $10 AUS to visit the forest and see the temple. Be careful though these monkeys are cheeky and stole my water bottle from my bag! When we arrived at Lalasa Villas we were greeted by 2 beautiful puppies at reception and I was in love! We soon found out the dogs lived at the hotel and were named Google and Wifi! Cute! They followed us down to our villa to show us around. The restaurant where they served breakfast was so peaceful and looked over the rice fields. Beside the restaurant was our 2 story villa and it was breathtaking. Its living area opened up to the pool and across from it was a king sized bali hut. The most perfect space for someone wanting a relaxing vacation, but today we wanted to explore! We hired a scooter and made our way through the rice fields that lead to the beachfront. All our Instagram cafes we’ve been dying to try out are located along one street leading to fins beach club. We found Sun of Panama and spent the afternoon laying by the pool with the best burger and even better cocktails. Day 6: The plan today is to relax, and that’s all we did. A good sleep in till 9:30am followed by a tummy full of delicious Balinese food for breakfast. We hung around our beautiful private pool for most of the day before hunting down another café for an early dinner. We found ourselves at Folie bali and this was a new favorite that has popped up in a back of Canggu. Its French styled décor and mouth-watering food made this restaurant the new Instagram hit. After full bellies and amazing photos we headed back to Lalasa villas and enjoyed the pool side for a night swim. Day 7: We were on the move again today but this time staying in Canggu. We got up early to enjoy a fresh smoothie bowl at bali bowls as the sun began to grow high very quickly. We headed back to Lalasa Villas and enjoyed our villa by the pool until checking our at 12pm. Our next stop was the Kalapa Resort just located 10 minutes up the road. It was quietly hidden behind the back streets of Canggu and was keeping it’s beauty a secret. We were welcomed by a refreshing drink and then shown to our beautiful wooden cabin. This place was nothing like the other hotels and villas we have stayed at and I cant explain how magical it felt. It had a beautiful balcony with table setting and a hammock that looked over one of the two pools. You walked into the front wooden doors to an open planned living area with a bed that was styled perfectly to the very last detail. Then following through to the outdoor bathroom with a big tub and shower. This place was a retreat. 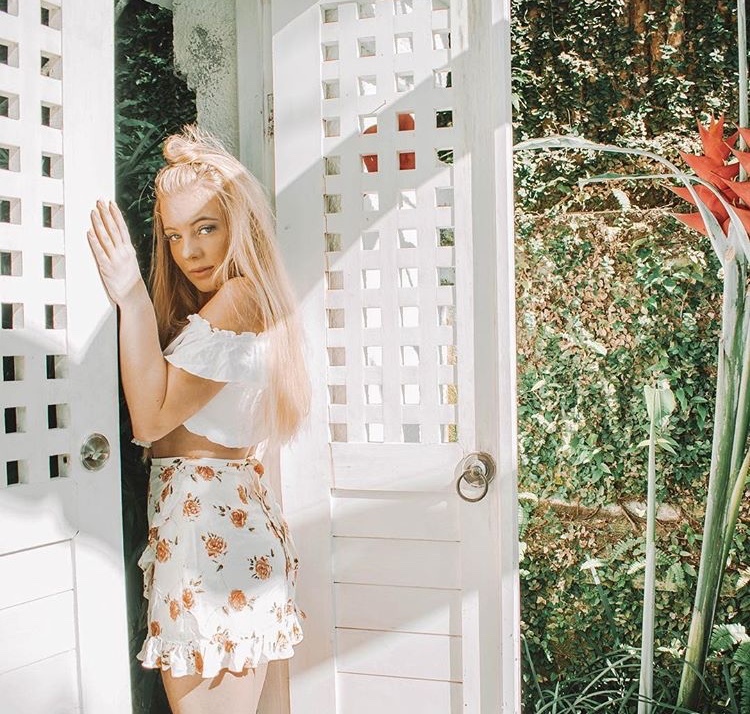 We lounged around our cabin and edited photos to escape the heat then hired a scooter through the resort. Today was Halloween and we haerd that SAFIA was playing at Finns Beach Club to celebrate. We headed back into town and enjoyed the music with some amazing nibbles. The whole night only cost us $20 AUS each and was the perfect way to spend the event! DAY 8: After getting home pretty late from Finns Beach Club the night before we enjoyed a long sleep in from the comfort of our quite bed. It was so peaceful here. We finally made our way up to the restaurant and enjoyed a beautiful breakfast beside the rice fields. The rest of the day was spent pool side and enjoying every minute being away from the upcoming town of Canggu. Day 9: Moving day again today but this time to Seminyak. A busy hub for good shopping and even better food! We absolutely love Seminyak for somewhere to hang out at beach clubs and meet up with friends and we could not wait to get going. Before we checked out we enjoyed banana pancakes at beautiful Kalapa and said our goodbyes to the beautiful staff. We called our driver and took a 20 minute drive to Villa air in Seminyak. We passed some of my favorite well known restaurant’s and cafes and I was so excited for the next few days! The villa was so beautiful! Its palm garden surrounded the pool and living area which made it its own slice of tropical heaven. The bedroom opened out to view the pool and was an easy access for a morning swim. I also heard that that villas had one of the best spas in Seminyak and I was so in need for a good massage. Day 10: Massage time! We were booked in for an hour massage at the Villa Air spa and we were so excited. The spa layout was so beautiful. It hung white flowers over the entrance and smelt like peppermint. We were welcomed by a cucumber drink and picked out which oil we would like used on us. We then spent a whole hour in heaven as we got our couple massage. After being so relaxed we felt like nothing but lazing around our pool area as the kitchen staff brought breakfast to our villa. Sunbaking and swimming took up most of our day till we hungered for a good early dinner. We scootered down the road when we came across Coffee Cartel and fell in love with is layout and décor. We spend the rest of the afternoon enjoying a few drinks and way to much good food. Day 11: We woke up to a beautiful breakfast by our pool and enjoyed every last minute of our time at villa air. We heard a knock on our villa door and one of the beautiful ladies from the spa came to say goodbye with a beautiful gift from her shop for me to take home. We checked out and made our way to our next hotel. 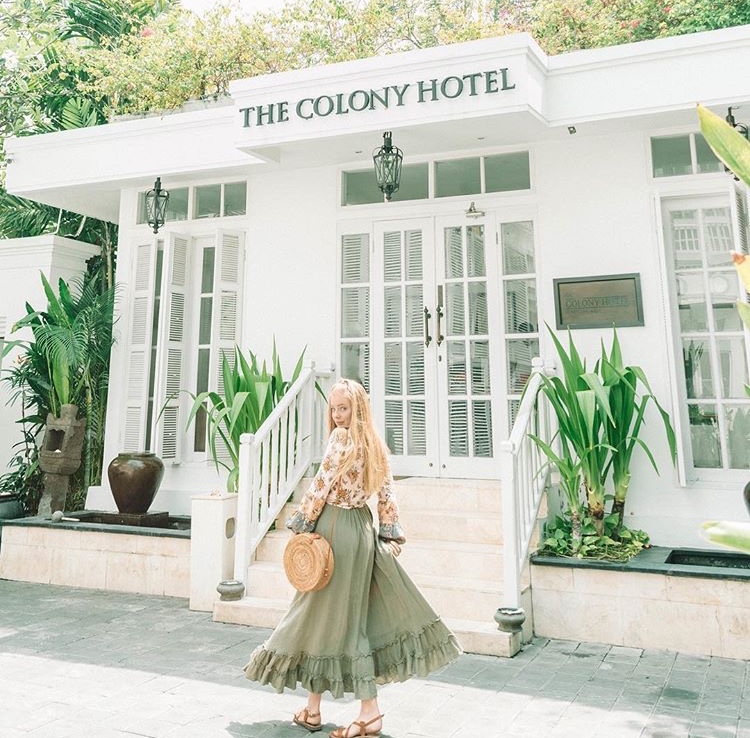 The Colony Hotel is located in the heart of Seminyak right next to Sea Circus, one of my favorite restaurants. Its tucked away but such a hidden secret. Its French styled building and décor make this the most glamour styles hotel we have been in yet. Marble floors and gold trimmed furniture filled our poolside room located right next to the restaurant. Unfortunately the clouds and passed over and the afternoon poured so we laid tucked in our new room till night fall. Day 12: We woke up to the sun shining and made our way to the restaurant where we were served American and Indonesian breakfast. We sat by the pool till our bellies settled then made out way into Seminyak for some long needed shopping. The shopping in Seminyak is amazing, there are a mix of retail stores and markets all down the main street and you will guarantee pick up a baring! After a full day of shopping we heading back to the colony to drop off our bags and dine in at sea circus just in front of the hotel. If your looking for a strong margarita and the best fish tacos this is the place. We spent the rest of the night giggling and having a few to many drinks before walking back to our room and finished with the night tucked in bed watching cartoons. Day 12: Our last day in Seminyak but not our last in Bali. Today we were adventuring back to Canggu to spend our last night before heading back to Australia. We started our day off beside the pool in the restaurant and enjoyed a well-needed breakfast before checking out. The colony was definitely one of my favorite hotel finds because of its location and I was so sad to leave. We headed back into Canggu and checked into the beautiful Theanna Vilas located on the main strip of town. This villa was magical. We had our own pool that the bathroom opened up onto and it was like no other hotel we stayed at. I really enjoy finding hotels that are different as each one then feels like a new adventure. We were greeted to a welcome massage and cold drink and left to enjoy our short stay. Today was so hot so we made our way down to the beautiful pool bar located within the hotel for some drinks and a good swim. It had its own infinity pool that looked over the rice fields. Before we knew it the sun was setting and we took a scooter down to watch the sunset over Canggu beach. I cannot believe how fast these last few days have been going! Day 13: Sadly today is our last day in beautiful Bali but I will definitely be returning very soon! Today breakfast was a little different as we had it in our pool. Floating breakfasts are one of the amazing things Theanna has to offer. We sat in the shallows of the pool and ate before having to pack up and leave for the airport. Bali has my heart and is my go to for a long weekend get away to a adventurous months stay. I cannot wait to be back here in a few months time to explore the new upcoming places that are already starting to pop up. 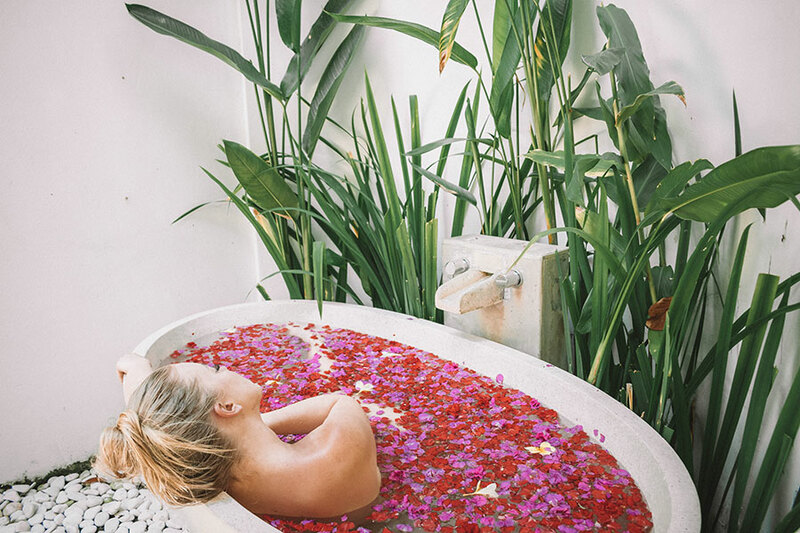 Bali swing, located in Ubud is so magical and run by some beautiful locals. While your up here also check out the famous rice fields and the monkey forest. The hands down best spa was Villa Air Spa. 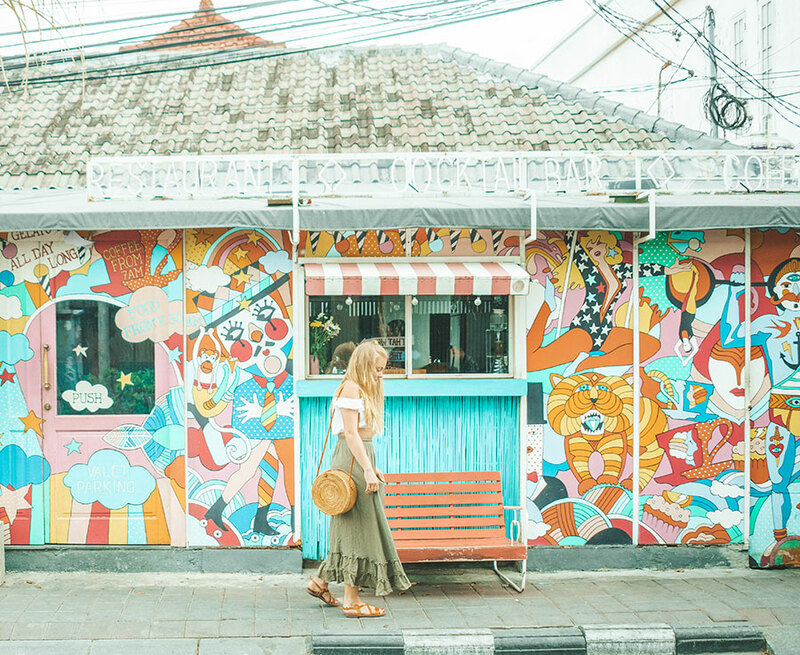 Main street of Seminyak is where you will find a mix of local markets and retail stores where you will find a bargain! Hair mask! Trust me on this!